The Incredible Drew Brees Story is The Most Incredible Story in History! Forty-Two Years Ago, in 1976, I was living in Dallas, Texas and I was a Talent Scout for The Dallas Cowboys. Then, Twenty Years Later, I was living in Houston, Texas and I was in The Astrodome and Scouting a High School Senior from Austin, Texas. I’m positive that I lost you in those first two Sentences, so let me explain. Twenty Years after 1976 was 1996 and I was living in Houston, Texas. I had just Founded The First High School Football Recruiting Service in 1979 and I was getting ready to go to The Texas 5A Semi-Finals Football Game in The Astrodome. I will always remember that this 5A Semi-Finals Game was going to be a really great game between a Very Talented Local Aldine High School Team against an Undefeated Austin Westlake Team. At this Game in The Astrodome, I found out that the Austin Westlake Chaparrals had an Incredible Passing Quarterback and he was in Total Control of the Game from Start to Finish and the Chaps won that Game 42-21, sending them to The 1996 5A State Championship Game, again in The Astrodome on the Following Saturday, against another Super Football Team, Abilene Cooper. After Austin Westlake easily beat an Always Tough Aldine Team, I decided to do some Research on This Westlake Super-Star, but Short, Quarterback. I knew that Drew Brees was not on my National High School Football Recruiting List or on any other College Football Recruiting Lists, but I also found-out that Brees had an ACL Injury as a Junior, but by leading his Team to a 15-0 Record and into The 5A Texas State Championship, this guy needed to be Recruited and Recruited by a Lot of Major College Football Teams. I Immediately put Brees on my National Recruiting Top Players List and into the Max Emfinger’s National Recruiting Newsletter. With what I had already seen him do to a Powerful Aldine Team, I Rated and Ranked him as one of the Top Five or Six Quarterbacks in the Country and I could not wait until The 5A State Championship Game in The Astrodome. In The 5A State Championship Game, I was on the Austin Westlake Sideline and I watched Brees with Great Interest on every single play and he was Incredible as he led his Chaps Team to an Unbelievably, Convincing 55-15 Victory over another Powerful Abilene Cooper Team and The Texas 5A State Football Championship. In this 5A Texas State Championship Game, I also noticed that Brees had a Knee Brace on his Left Knee and after the Game, as I was leaving The Astrodome, I saw Brees and I was about to ask him how his Knee was doing, but some of his Teammates came-up to him and I decided not to try to ask him. My 1996 December Recruiting Newsletter was Mailedthe next weekend and I put hisFinal Passing Stats in it that included 211 of 333 Attempts for 3,528-Yards and 31 Touchdowns. This was Impressive, but his 64% Completion Record was just as Impressive. The Max Emfinger’s National Football Recruiting Newsletter was sent to Around 12,000 Individual Recruiting-Buffs and about 75 College Football Teams, including Purdue and Texas. Later, in December, I got another Call from Purdue Offensive Coordinator/Recruiting Coordinator Jim Chaney and he asked me about this Quarterback named Drew Brees. Purdue had just hired Head Coach Joe Tiller (In Blue Shirt) and Offensive Coordinator/Recruiting Coordinator Jim Chaney (In Burgundy Shirt) from Wyoming and they were a little behind in their Recruiting and they were looking for some “Recruiting Steals” on some Super-Star Players that might have been “Flying Under the Radar” to most College Teams. I Never talked to Coach Tiller, but I had talked to Coach Chaney a couple times and I knew that they were looking for Players like Drew Brees, Andy Dalton, and Kliff Kingsbury for Their Unbelievable Passing Spread Offense. I then got another call from Coach Chaney in January and he told me that he and Coach Tiller both really liked Drew Brees and that they were going to have him in for an Official Visit on the Final Weekend in January before National Signing Date on the First Wednesday in February. While at Purdue, Chaney, along with Head Coach Tiller, (Both in the Photo Below, became known for using the “Spread Offense” which was Famously “Dubbed” as “Basketball-On-Grass” at a Time in College Football History when Almost all of The Great Football Teams were Using The Running-Game and The Passing-Game was Considered a Huge Novelty and The Passing-Game was not even-being used. Later, it became The Air-Raid Passing Attack Offense with My Good Friend and Coach Mike Leach. The Purdue Offensive Game Plan Relied on a Strong Passing-Game and The Chaney Offense was one of The Most Successful Offenses in the Country. This was evidenced by the fact that Their Future Super Bowl Winning Quarterback, Drew Brees, was His Starting Quarterback from 1997-2000 and this Unbelievable Passing Offense Broke Numerous Purdue, Big-10, and NCAA Passing Records. New Georgia Head Football Coach Kirby Smart made his first big hire as The Georgia Head Football Coach when he made Coach Jim Chaney The New Bulldog Offensive Coordinator and Leader of his Georgia Offense. While Chaney has spent six of the last seven years of his career in the SEC, Many of the Bulldog Fans may not know much about the Long-Time Incredible Offensive Coordinator. New Orleans Quarterback Drew Brees put up Fabulous Stats under Jim Chaney at Purdue With 11,560-Yards and 90 Touchdowns. After Three Incredible Years as The Georgia Offensive Coordinator, Coach Jim Chaney (In Photo Below) Has Agreed to a Three-Year, $4.8 Million Contract, with The Rival Tennessee Vols, that runs through January 31, 2022. In his New Contract, Chaney will Earn $1.5 Million in The 2019 Season, with an $100,000 Increases in each of the Next Two Seasons. The Vols Head Coach Jeremy Pruitt Pillaged another SEC East Rival Team to get The Great Offensive Coordinator that they Desperately Needed. Chaney is familiar To Knoxville as He was The Tennessee Offensive Coordinator during The Lane Kiffin and Derek Dooley Eras. Under Chaney, The Georgia Offense Ran a Pro-Offense, just as Purdue, which Coach Pruitt Favors. But, Back to The Drew Brees Story! There were also a number of Ironies with Drew Brees and his Signing with Purdue. The reason that I started my High School Football Recruiting Service in 1979 was Because “Big-Time Politics” had Taken over College Football Recruiting to the point that you could Never believe anything that The Media had to say about The Top Players. My wife, told me one day: “If you don’t believe what The Sportswriters have to say, why don’t you start your own Service,” Ginger Said. Politics in College Football Recruiting has gotten even worse since then, but that’s a Complete other Different Story, so let’s get back to the Drew Brees Story. One huge Ironic Fact was the Fact that although Drew Brees Lived in Austin, Texas and only a Few Miles away was The University of Texas, but he was not Recruited by the Longhorns, because they had already Recruited Two Quarterbacks and had Verbal Commitments from both of them. The Longhorns thought that both of these Commitments Were Outstanding. At that time, one of The Longhorn Recruits was a 6-1 Athletic Quarterback Named Major Applewhite of Baton Rouge Catholic, Louisiana, and I saw him play in Baton Rouge and I Thought He Was One Of The Top Quarterback’s in the Country. The other Longhorn Quarterback Recruit was a 6-4 No-Huddle Passing Quarterback Named Greg Ciero of Anaheim Servite, California. He also was a Top Quarterback and he had a lot of Raw Potential. As Freshmen, neither of these two Great Longhorn Quarterbacks would have to play, because they would both be playing behind Senior Super-Star James Brown. Then, As a Sophomore, Applewhite became a Texas Super-Star, while Ciero Transferred to Polomar Junior College and then was Selected Junior College All-American before Transferring to Baylor University. The Irony was that all Three Quarterbacks that could have ended-up as a Texas Longhorn Became Super-Stars in 2000. Although the ABC Quarterback Club of Applewhite, Brees, and Ciero were Highly Successful; only one of those Three Quarterbacks was Sitting in New York at both the 1999 and 2000 as Finalists for The Heisman Trophy Award. Brees did not have an Eye-Popping Freshman Campaign, at Purdue, but Coach Chaney gave him a chance to be the Starting Quarterback for The Boilermakers Spread Offense as a Sophomore. Brees, then was so Unbelievably Impressive, as a Sophomore, Brees was Selected by his Teammates as the Boilers Team Captain in both his 1999 and 2000 Seasons. After Finishing Fourth in the 1999 Heisman Trophy Voting, Brees had a chance to Come-Out Early for The 1999 NFL Draft, but he Decided to Stay With Coach Tiller and Coach Chaney and he decided to Come-Back for his 2000 Senior Season. 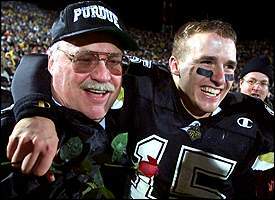 In that Senior Season, Brees led The Boilermakers to Last-Minute UPSET Victories over both Ohio State and Michigan, giving Purdue, Coach Tiller, and Coach Chaney their First Big-10 Championship in Three Decades. “Boilermaker Fans, had you ever thought we could be going to The Rose Bowl,” Brees Shouted to the Fans as he Accepted the Big-10 Championship Trophy. “This is, by far, The Greatest Moment of my Life, so Far,” Brees Further Said. In that Game Against Indiana and Against Another one of my Long-Time, Good Friends, Head Coach Cam Cameron, Brees threw for one Touchdown and ran for another Touchdown. He Completed 20 of 29 Passes for 216-Yards and ran for another 85-Yards, giving him 301-Yards of Total Offense as he became the First Quarterback to lead The Boilermakers to Pasadena since Bob Griese. It was their First Big-10 Championship in 34 Years. 2000 Heisman Trophy Finalists L to R: QB Drew Brees, Purdue; Heisman QB Chris Weinke, FSU; RB LaDainian Tomlinson, TCU; and QB Josh Heupel, Oklahoma. After another Fabulous Season, Brees was again Selected as a Finalist for The Heisman Trophy Award. 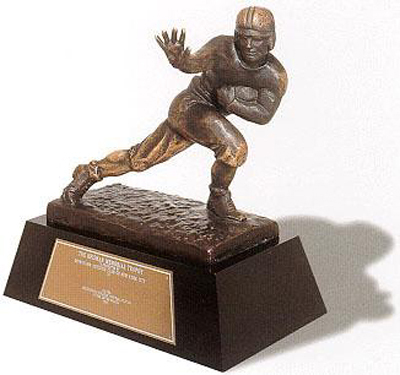 The Top Four in the Heisman were Heisman Trophy Award Winning QB Chris Weinke of Florida State; QB Josh Heupel of Oklahoma; QB Drew Brees of Purdue; and RB LaDainian Tomlinson of TCU. These Four Super-Star College Football Players were Sitting in New York City on December 9, 2000 for The Heisman Trophy Award. The 2000 Heisman Trophy Award Re-United Two Great Football Players from Texas, including Brees from Austin Westlake and Tomlinson from Waco University, just a few miles apart on I-35. In Fact, I lived in Austin, twice for Two Years and Waco twice for Six Years. Brees and Tomlinson had both played together in a Texas High School All-Star Football Game and had become Great Friends after their High School Football Season and now these Two Great Texas Football Players were together again in New York City as Finalists for the Heisman Trophy. “Wouldn’t it be Great if we could both play on the same NFL Team,” Tomlinson told Brees in New York City. Brees left Purdue with “Mind-Boggling” Stats and one of the Most Impressive Quarterbacks in Big-10 History as he broke Two NCAA Passing Records, 13 Big-10 Records, and 19 Purdue Passing Records. Some of these Records are still standing, including his 1,026 Completions for 11,815-Yards Passing, and 90 Touchdown Passes. His 12,692-Yards of Total Offense was also a Record. He also had Seven 400-Yard Games and Sixteen 300-Yard Games. So now it’s time for The NFL Draft, but before the 2001 Draft, Brees attended The 2001 NFL Scouting Combine where he did much better than most NFL Scouts had expected. All of The NFL Scouts knew that he was about Six-Foot, but they did not know that he was so Quick as he Shocked them when he ran an Amazing 4.21 in the Pro-Shuttle and Ran a 4.83 Forty at the Scouting Combine, but on Pro-Day, he improved that Forty Time to a Great 4.67. Also Remember that a lot of NFL Passing Quarterbacks can not run a 5.0 Forty. I will NEVER forget The Night on The Dan Patrick Show when Brees Laughingly read his NFL Draft Profile on the Air: “There is a Question about Drew Brees ability to throw the Deep Pass; but his Accuracy is a Question, and of course, his Height is a Question.” – Brees Laughingly Said. Although Brees did not have Great Height, he had Incredible Passing Stats and Shockingly Great Measurables for a Passing Quarterback; but he was not Drafted until The San Diego Chargers took him in the First Pick of Round Two in the 2001 Draft which was the #32 Overall Selection. Sometimes, The Lord works in Strange Ways his Miracles to Perform. In The 2001 NFL Draft, The San Diego Chargers selected RB LaDainian Tomlinson as their #1 Draft Choice. Everyone thought that Drew Brees would be Drafted in the First Round of the 2001 NFL Draft, but too many NFL Teams believed that he was Too Short to become a Great Passing Quarterback in the NFL, but if he was Drafted in The First Round, he Would Have NEVER Been able to Play onThe Same Team with his Good Friend, From Texas. The San Diego Chargers Got Two Incredible Texans in The 2001 NFL Draft Picks That Were Both Heisman Trophy Award Candidates in RB LaDainian Tomlinson and QB Drew Brees! The Miracle that was Performed was that the San Diego Chargers were able to Re-Unite these Two Texans, Brees and Tomlinson, as they were able to Select Brees in the First Draft Pick of the Second Round of the NFL Draft to go with their #5 Overall Selection of Tomlinson in The First Round. The Chargers were able to get an Unbelievable Two Super-Star Players that were both in New York City for the Heisman Trophy Award. With the help of The Miracle of Re-Uniting with his Texas Friend LaDainian Tomlinson, Brees began his NFL Career in 2002, with The San Diego Chargers. Then Two Years Later, with My Friend and Offensive Coordinator Cam Cameron, Tomlinson, and Brees helped lead The Chargers to a Division Championship; while Tomlinson was Selected All-Pro and Brees was Selected to the 2004 NFL Pro Bowl. 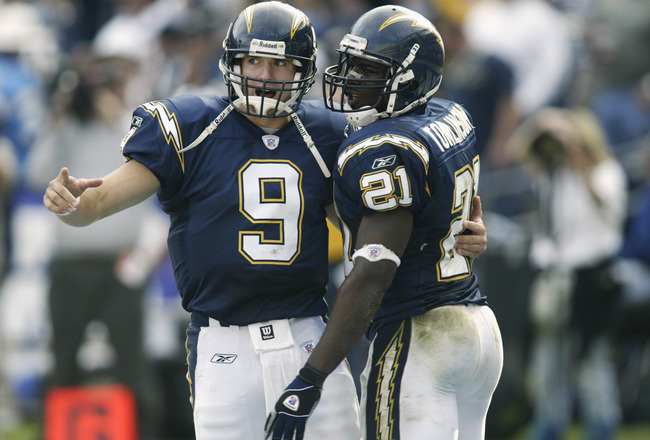 These Two 2001 NFL Super Draft Picks (#9 QB Drew Brees) and (#21 RB LaDainian Tomlinson) Of The San Diego Chargers Helped The Chargers in 2004 To Win Their First Divisional Championship In A Decade And Both Players Are Future NFL Hall Of Fame Players! Then Nine Months Later, in 2005, after suffering a Really Bad Shoulder Joint Dislocation and a 360 degree tear of his Labrum and Rotator Cuff, Brees became an NFL Free Agent. In the last game of the 2005 Season, Brees should not have been playing in the Game. The Chargers were 9-6, but they had absolutely no chance of improving their NFL Playoff Seeding as the Game started. However, General Manager A.J. Smith and Head Coach Marty Schottenheimer had already started a War that would eventually lead to the Departure of Schottenheimer from The Chargers, because of the Quarterback Position War. In his Rookie Season, Philip Rivers, although he was seen as the future Chargers Franchise Quarterback, was named as the Third Team Quarterback on The Chargers Roster behind Brees and Doug Flutie. By not Starting Rivers, in the Last Game, it looked like it was a Punishment for Rivers, because he was a Hold-Out and missed part of The Training Camp. In this Last Game of the Season, Schottenheimer made the decision to start Drew Brees in a Meaningless Game so that the fans would not see their Young Future Super-Star Philip Rivers. So, here is what happened. Standing in his own End-Zone, Drew Brees was Sacked by a blitzing John Lynch. He fumbled The Football when he was hit, and when he dove back on top of the Football, Brees was Crushed by Gerald Warren in a Bone-Rattling Tackle. Brees left the Football Game in obvious pain and he then handed the team over to Philip Rivers. As Brees became a Free Agent after that 2005 Season, he was not expected to return to The Chargers, because they had already Committed a Lot of Money to Quarterback Philip Rivers. The Chargers eventually designated Brees as their Franchise Player, giving him a One-Year Contract that quadrupled his pay to $8 Million for the 2005 Year. Under the terms of a Franchise Player Contract, Brees would then be Eligible to be Traded or Sign with another NFL Team, but The Chargers would then Receive two future #1 Draft Choices in return. Brees was not traded and continued as Starting Quarterback for the remainder of the 2005 Season. At this time, there were Two NFL Teams that needed a Quarterback and those Two Teams were The Miami Dolphins and The New Orleans Saints. The Saints were coming off of a Horrible 3-13 Record, and Dealing with Hurricane Katrina, but they had just hired a new Head Football Coach named Sean Payton and Brees wanted to Sign with a Team that would Guarantee him a Starting Quarterback Spot. The Dolphins wanted to Sign Brees, but The Dolphins did not want to offer him as much money as The Chargers and they would not Guarantee him a Starting Quarterback Spot. With new Head Football Coach Sean Payton, The Saints Offered The Same Salary as The Chargers, but Coach Sean Payton (In Photo Below with #9 Brees) was willing to Guarantee him a Starting Quarterback Spot if he could get Healthy before coming to The Saints Training Camp. It only took Brees one trip to Katrina Stricken New Orleans to know that he Could make a huge difference in The Saints Football Team and also the People of New Orleans. So he Signed with The New Orleans Saints, got Healthy before Training Camp, and then led them to an Unbelievable 10-6 Record in his First Season. After Signing with The Saints, Drew Brees Earned Nine Trips to The Pro Bowl; was a 2006 NFL All Pro Team Selection; was 2006 Walter Payton Player of the Year; was 2008 and 2011 Offensive Player of the Year; and was Super Bowl XLVI Super Bowl Game MVP Against The Indianapolis Colts. Brees was also Selected 2004 Comeback Player of the Year; and was also Selected in 2011 by Sports Illustrated as Sportsman of the Year. After Playing in 17-Years in The NFL; Playing Five Years with The Chargers and Twelve Years with The Saints. His Hall of Fame Career Stats in 249 Games, included 6,222 Completions out of 9,294 Attempts for 70,445-Yards Passing and an Incredible 488 Touchdown Passes. Brees takes Great Pride in his On-The-Field Performances, but he also takes Great Pride in his Community Service Endeavors. Drew and his Beautiful Wife, Brittany, Established The Brees Dream Foundation in 2003 and since then have Contributed and Committed almost $25,000,000 to help improve the quality of life for Cancer Patients and To-Provide Care, Education, and Other Outstanding Opportunities for Children and families in need. Brees has also proudly participated in five USO Trips to Kuwait, Iraq. Afghanistan, Germany, Turkey, Djibouti, Dubai, Okinawa, and Guantanamo Bay. Drew Brees and Beautiful Wife Brittany! 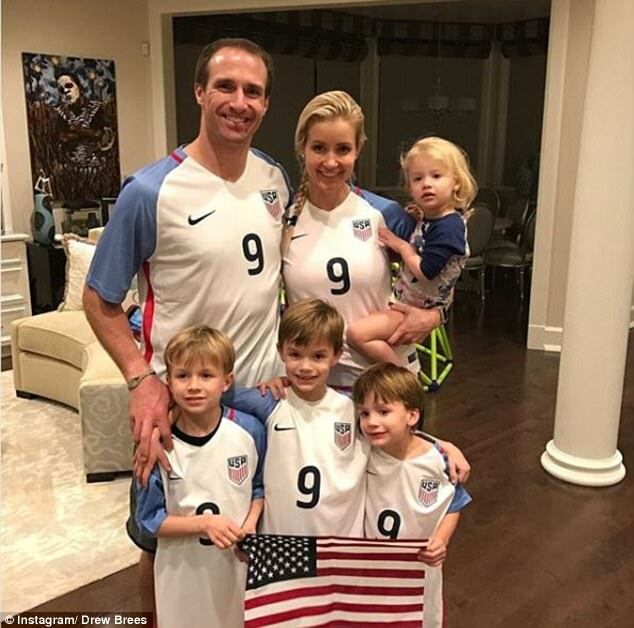 This Special Drew and Brittany Brees Couple was Married in 2003 and Their First Baby Boy, Baylen Robert Brees, was Born on January 15, 2009, which was Drew’s 30th Birthday. Then, Their Second Baby Boy was Born in 2010 and he was Named Bowen Christopher Brees. Their Third Baby Boy was Named Callen Christain Brees and was born in 2012. The Drew Brees Family got even bigger in 2014 when Brittany gave birth to Their First Baby Girl and Daughter, in Rylen Judith Brees. This Special Brees Pair Announced the Special Arrival of Their First Daughter with a Tweet on Twitter, just before they Announced Her Arrival to The Media, just before Practice. THE INCREDIBLE DREW BREES CAREER! Brees led his Austin Westlake High School Football Team to The Texas 5A State Football Championship; led his Purdue College Team to The Big-10 Football Championship; led his San Diego Chargers NFL Team to a Divisional Football Championship; and led the New Orleans Saints NFL Football Team to The Super Bowl Football Championship. What more can I say about Drew Brees? Clemson Tigers Win College Football Playoffs National Championship! In The 2018 National Championship Game between The Alabama Crimson Tide and The Clemson Tigers, The Tigers Produced One of The Most Impressive and Dominant CFP National Championship Performances in College Football History in The Amazing 44-16 Clemson Tigers Victory over The Alabama Crimson Tide. This Game was going to be an Unbelievable History-Making Championship Game. First of all, both Teams had Posted a 14-0 Record for The 2018 Football Season and The Winner of The Game Would Become The First Team in College Football History to Finish The Football Season with a Perfect 15-0 Record. This was also The Fourth Season In-a-Row that Both Alabama and Clemson would Play in The CFP National Championship College Football Four-Team Playoffs, and The Third Time that these Two Teams would Play in The National Championship Game. With this 2019 College Football National Championship Trophy, Coach Dabo Swinney has been Awarded This Trophy Two Times, out of The Five Trophies that have been Awarded since 2015 and Second Trophy in Three Seasons. “We are gonna enjoy this one,” said Swinney. “We’ve got a Nice-Spot to put our New National Championship Trophy in our Facility, right next to that other Trophy. We’ve got Twins,” said Swinney. With this Impressive 44-16 Clemson Victory on Monday, The Tigers have now Won Two of The Three Games, as they Added Another National Championship to Their 2016 National Championship. The Tigers, With Head Coach and Long-Time Friend, Coach Swinney, looks-like the only Football Program in The Country that Dares to Disrupt The Incredible Alabama College Football Dynasty. The Tigers also look-like The Only College Football Team that has The Overall Football Talent To-Challenge The Crimson Tide and any other College Football Team for The National Championship. The Crimson Tide still have Won Five National Championships since The 2009 Football Season, but in the Last Three Seasons they have Lost Two National Championship Games to Coach Swinney and The Clemson Tigers. True Freshman Quarterback Trevor Lawrence (#16) Passed for 347-Yards and 3 Touchdowns and Justyn Ross (#8) Caught Six Passes for 148-Yards and 2 Touchdowns as The #2 Ranked Clemson Tigers Defeated The #1 Ranked Alabama Crimson Tide by a 44-16 Score on Monday Night in The Fifth College Football Playoff National Championship Game. If you Watched This National Championship Game, you would Understand how Impressive The Football Talent is for The Clemson Tigers and Their Unique and Unbelievable Camaraderie between The Tiger Players and Coaches. Many of The Clemson Defensive Super-Stars Came Back for Their Senior Year to Help Head Coach Dabo Swinney and Defensive Coordinator Brent Venables To Win The National Championship. I have been Evaluating Football Players for 48 Years and I have Never-Seen a better Quarterback Prospect than Trevor Lawrence. He has a Super Strong Arm and he Throws a Really Hard and Accurate Pass that his Talented Wide Receivers Can-Catch Quickly and Head To The End-Zone. Lawrenceis a#1 Overall NFL Draft Selection in The 2021 NFL Draft and his Freshman Wide Receiver Teammate, Justyn Ross, will Join-Him in The 2021 First Round Draft, as he was Also Sensational in This Game as he made Several Incredible Catches, Including a Couple One-Handed Catches. Sophomore Wide Receiver Tee Higgins also made Several Incredible Catches and he will be a #1 Draft Choice in The 2020 NFL Draft. TheTwo Clemson Super Stars are Still Teenagers, just out of High School. Lawrence Turned 19 in October and Ross Turned 19 a Couple Months Later in December. Think about what Lawrence at 6-6 and with The Unbelievable and Incredible Poise of Another Drew Brees, Tom Brady, or a Peyton Manning and Throwing Passes to Ross at 6-4, who is a Wide Receiver With Uncanny Athleticism and Acrobatic with Numerous One-Handed Catches. Ross (#8) Caught Six Passes for 148-Yards and 2 Touchdowns in The CFP Semi-Finals Game Against Notre Dame and with Those Numbers, he was Selected to The Super Scout All-American Bowl Game Team. 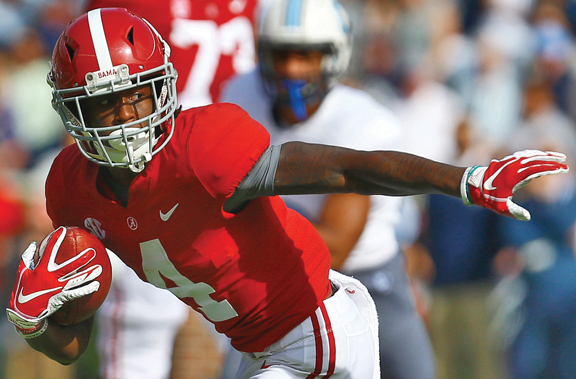 Then, with his Six Catches for 153-Yards in The National Championship Game, Ross Joined Lawrence and was Selected to The All-American Bowl Team for The Second Time. In Both Games, Ross Recorded his Best Two Games of The 2018 Football Season. Also Remember that Both Ross and Lawrence were in High School Last Football Season. The Unbelievable Ross made an Incredible Juggling Catch, another Incredible One-Handed Catch, and then Broke For Still Another Mind-Boggling and Incredible 74-Yard Touchdown about Midway through The Third Quarter that Gave The Tigers a Tremendous 37-16 Lead and then we saw Coach Swinney High-Stepping Up-And-down the Sidelines. Then, they will Also have help from Super Sophomore All-American Running Back Travis Etienne who also was Very Impressive as he Rushed for 86-Yards, including a 17-Yard Touchdown Run and a 1-Yard Touchdown. Etienne also Caught a Short 5-Yard Touchdown Pass, from Lawrence, giving him 91-Yards of All-Purpose Offense and 3 Touchdowns in The Victory. Many of The Clemson Tigers Top Talented Players in The National Championship Game were Freshmen or Sophomores Skill Players, including Freshman Quarterback Trevor Lawrence, Freshman Wide Receiver Justyn Ross, Sophomore Wide Receiver Tee Higgins, Sophomore Running Back Travis Etienne, Sophomore Cornerback A.J. Terrell, Sophomore Outside Linebacker Isaiah Simmons, and Junior Cornerback Trayvon Mullen. Those Talented Underclassmen Players were Sensational Skill Players, but The Junior and Senior Players who Came-Back for their Senior Seasons, after Considering The 2018 NFL Draft are just as Talented and they will be High 2019 NFL Draft Choices. I would Say that at Least Three of These Clemson Super Stars will be #1 Draft Choices in The 2019 NFL Draft. The Clemson Super Stars Include Defensive Tackle Christian Wilkins (# 42), Defensive End Clelin Ferrell, EDGE RUSH End Austin Bryant, Inside Linebacker Kendall Joseph, and Cornerback Mark Fields. The Amazing Wilkins Earned All-American Honors in each of his Four Seasons for Clemson. As a Senior, Wilkins Recorded 50 Tackles, Including 15 Tackles for a Loss, 6 Quarterback Sacks, 1 Forced Fumble, 1 Blocked Kick, 2 Pass Breakups, and 6 Quarterback Sacks. Wilkins also Rushed for an Amazing Two Touchdowns. Wilkins was Honored By Receiving The Prestigious Campbell Award Trophy as The National Scholar Athlete of The Year. He Graduated last December with a Bachelor’s Degree in Communication Studies with a Great 3.33 Grade Point Average and became The First Clemson Scholarship Football Player To-Complete a Bachelor’s Degree in 2.5 Years. Wilkins has also Received his Masters’s Degree in Athletic Leadership and Wanting To-Make a Difference off The Field, Wilkins became a Certified Substitute Teacher During The 2018 Off-Season. “We are 15-0, Beat The Best Team Ever, and nobody is Taking That Away from us,” said Clemson All-American Defensive Tackle Christian Wilkins. Clelin Ferrell (#99 )led Clemson with 55 Tackles, Including 20 Tackles for a Loss, 11.5 Quarterback Sacks, 3 Forced Fumbles, 1 Fumble Recovery, and 13 QB pressures. Ferrell also was Selected to The Prestigious Ted Hendricks Trophy Award as The Top Defensive End in The Country. In The Championship Game, Ferrell Recorded 1.5 Tackles for a Loss and Made One of The Most Impressive Individual Defensive Plays of The Game as he Dragged-Down Alabama Quarterback Tua Tagovailoaas he Escaped To The Left on a Fourth Down Play Inside The Red Zone in The Third Quarter. Just minutes after The Clemson Tigers Stunned The Alabama Crimson Tide in The CFP National Championship Game, The Recruiting Season Started. Following The Incredible 44-16 Clemson Victory, The Tigers All-American Defensive End Clelin Ferrell grabbed the microphone and delivered a quick, “Suge” Knight-Inspired Promo to all The Highly Recruited, Touted High School Football Players Across The Country. “Our guys had The Eye of The Tiger and I’m so proud for our Seniors to be able to go out with a 15-0 Record and Truly be The Best Team Ever,” said Coach Swinney. There was a lot of talk about The Best Team Ever all year long,” Swinney said in talking about Alabama. Clemson had Five Players Voted to The Atlantic Coast Conference All Conference Team and Travis Etienne Led The Conference in Voting. In The National Championship Game, Super RB Travis Etienne (#9) Rushed for 86-Yards, including a 17-Yard Touchdown Run and a 1-Yard Touchdown. Etienne also Caught a Short 5-Yard Touchdown Pass, from Lawrence, giving him 91-Yards of All-Purpose Offense and 3 Touchdowns in The Victory. Etienne, From Jennings, Louisiana, Was a First Team ACC All-Conference Player, and was Selected First Team All-American by ESPN and Second Team All-American by The AP and Walter Camp. In The 2018 Season, Etienne Rushed for 1,658-Yards and 24 Touchdowns and an 8.1 Yards Per Carry Average. The NFL is Projecting Etienne as a 2020 #1 Draft Choice. Tee Higgins(#3) is an Unbelievable Wide Receiver who was The Top-Rated High School Recruit in The 2017 Recruiting Class After he Caught 68 Passes for 1,044-Yards and an Incredible 18 Touchdowns at Oak Ridge Tennessee High School. Higgins (6-4, 210, 4.33, 40, 4.08) Recorded Some Fabulous Measurables With a 4.33 Forty, 40-Inch Vertical Jump, and a 4.08 Pro Shuttle. “Tee Higgins is one of The Most Talented Kids I’ve ever seen on a Football Field,” Said Clemson Head Coach Dabo Swinney on watching Higgins play in high school. Do you think that all of these Clemson Super Stars have Coach Swinney Drooling about More CFP National Championships in The Very Near Future. And Super Scout Most Valuable Offensive Player! SCOUTING NOTE I: In Selecting College Weekly MVP’s, The Player had to be on The Winning Team, but in Selecting The Christmas All-American Teams, some of The Most Outstanding Players in The Country and with Some Unbelievable Stats were Deserving to be Rewarded and so I have gone back and added Several MVP Awards to Players, although they Had Lost their Game, but they Had Some Incredible Stats. 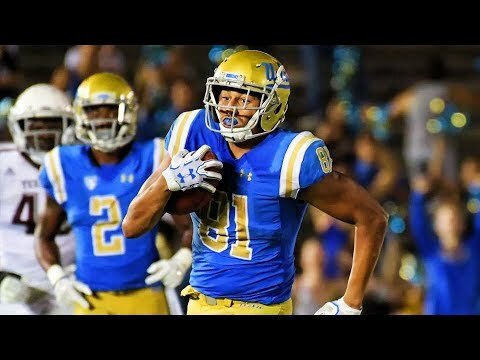 EXAMPLE: U-Mass WR Andy Isabella Caught Passes for 198, 191, 303, and 219-Yards, but He Lost in each Game; while UCLA TE Caleb Wilson Caught Passes for 164 and 184-Yards Against Arizona State and Stanford, but Lost; and LSU Super Linebacker Devin White Recorded 17 Tackles, including 12 Solo Tackles, 1 Sack, 4 TFL, and 1 Forced Fumble, but Lost Against Texas A&M. The SEC Still Selected White as The SEC Defensive Player of The Week. Walter Camp Player of The Year; SEC Player of The Year; and Maxwell Award Winning Alabama QB Tua Tagovailoa and Super Scout Runner-Up MVP Offensive Player! SCOUTING NOTE II: The Three Offensive Players of The Year, with More Than 7 MVP Awards Included Super Scout MVP QB Kyler Murray of Oklahoma With 10 MVP Awards; Super Scout First Runner-Up QB Tua Tagovailoa of Alabama With 9 MVP Awards; and Second Runner-Up QB Gardner Minshew of Washington State With 8 MVP Awards. SCOUTING NOTE III: This Super Scout Christmas All-American Team Took Longer than Anticipated, but I Hope Everyone Appreciates The Time Spent. Johnny Unitas Golden Arm Award Winning Washington State QB Gardner Minshew And Second Runner-Up Most Valuable Offensive Player! The Fred Biletnikoff Award Winning Alabama Wide Receiver Jerry Jeudy And Super Scout Co-Wide Receiver MVP Player! SCOUTING NOTE IV: It’s Interesting To-Note that Most Every Great Offensive and Defensive Player is able To Record Great Offensive and Great Defensive Stats, but some Really Fabulous Defensive Players Are Targeted and “Run-Away-From” on Every Offensive Play and thus Limiting Great Defensive Stats. Several Potential #1 Draft Choices in This Category Included DT Ed Oliver of Houston; DT Derrick Brown of Auburn; DT Dexter Lawrence and DE Austin Bryant of Clemson; DT Raekwon Davis of Alabama; SS Johnathan Abram of Mississippi State; DT Gerald Willis of Miami; ILB Joe Dineen of Kansas; ILB Jordan Kunaszyk of California; ILB Devin Bush and DE Rashan Gary of Michigan; and CB Greedy Williams of LSU, but I Included all of them on Either The Second or Third Team All-American Team. SCOUTING NOTE V: The Two Co-Defensive Players of The Year, with 8 MVP Awards include Edge Rush End Josh Allen of Kentucky and Nose Tackle Quinnen Williams of Alabama. 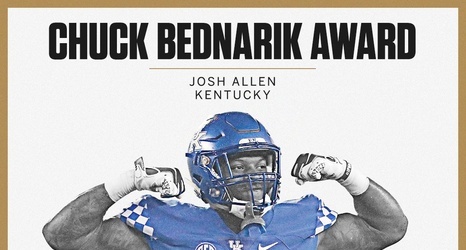 Bronco Nagurski Trophy; Chuck Bednarik Award; and Lott Impact Trophy Kentucky Edge Rush End Josh Allen And Super Scout Co-Most Valuable Defensive Player! 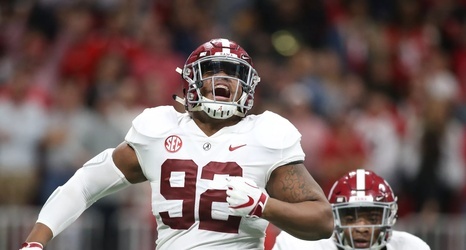 Outland Trophy Winning Alabama NG Quinnen Williams And Super Scout Co-MVP Defensive Player! Three defensive standouts – Devin White, Greedy Williams and Grant Delpit – along with placekicker Cole Tracy have been named mid-season All-Americas by various news organizations for their efforts in leading LSU to a No. 5 national ranking and a 6-1 overall mark at the halfway point of the season. Delpit, White and Williams were all named Mid-Season All-Americas by The Athletic, ESPN, and the Associated Press, while Tracy was recognized by The Athletic and was a second-team selection by the AP. 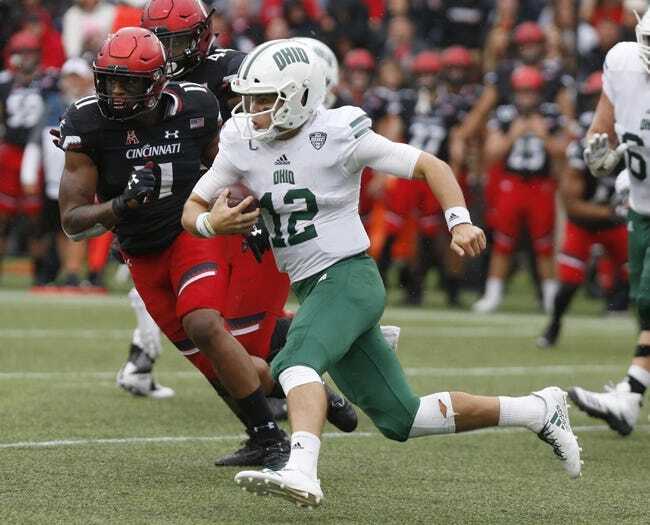 In addition to his spot on The Athletic’s Mid-Season All-America Team, Delpit was named by The Athletic national writer Bruce Feldman as the nation’s top defensive player for the first half of the season. In Eight Games, seven games, Delpit has recorded 44 tackles and leads the Tigers in tackles for loss (7.5), interceptions (3), and is second on the team in sacks (3) and passes defended (7). He also has four quarterback hurries, four pass breakups and a forced fumble to his credit. White, who is this week’s Southeastern Conference Defensive Player of the Week, has racked up a team-best 66 tackles, to go with 7.0 tackles for loss, one sack, three pass breakups, three passes defended and five quarterback hurries. He’s also recovered two fumbles and forced a fumble for an LSU defense that is allowing 16.9 points and 340.3 total yards per game. Last week against Georgia, White recorded 13 tackles and recovered a fumble in the 36-16 win over the second-ranked Bulldogs. As a unit, LSU held Georgia to season lows for points (16), total yards (322) and rushing yards (113). Williams, considered the nation’s top cornerback, has 22 tackles, a pair of interceptions and five passes defended for the Tigers. Tracy, who leads the nation with 17 field goals, has been named the SEC Special Teams Player of the Week three times this year. He kicked the first walk-off game-winning field goal in LSU history in the 22-21 win over Auburn in week 3 and then tied a school-record with five field goals in the victory over Georgia. Tracy ranks first in the SEC in scoring with 74 points and his 17 field goals already ranks No. 5 on LSU’s single-season list. Voter Panel: Bob Asmussen, Champaign (Ill.) News-Gazette; Matt Baker, Tamp Bay (Fla.) Times; Michael Barber, Richmond (Va.) Times-Dispatch; Matt Brown, The Athletic; Robert Cessna, Bryan-College Station (Texas) Eagle; Rece Davis, ESPN; Pat Dooley, Gainesville (Fla.) Sun; Scott Hamilton, WECT-TV Wilmington, North Carolina; Eric Hansen, The South Bend (Ind.) Tribune; Brian Howell, ; Rob Long, WJZ-FM 105.7 The Fan Baltimore; Sean Manning; Conor O’Neill; Soren Petro, 810 WHB Kansas City, Missouri; Keith Sargeant, NJ.com/The Star Ledger; Jon Wilner, San Jose (Calif.) Mercury New; and Max Emfinger, Super Scout. 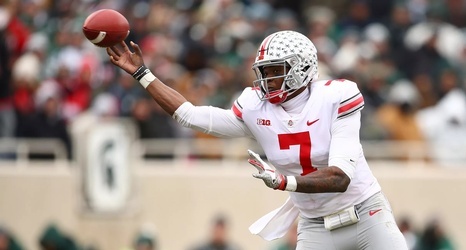 Others With Six or Seven MVP Awards include Ohio State QB Dwayne Haskins With Six MVP Awards, Plus Another One in The BIG-10 Championship Game, Giving Him Seven MVP Awards; Alabama Super Noseguard Quinnen Williams With Six MVP Awards, Plus Another One in The SEC Championship Game, Giving Him Seven MVP Awards; Texas A&M RB Treyveon Williams With Six MVP Awards; Clemson RB Travis Etienne With Six MVP Awards, Counting The One in The ACC Championship Game; Memphis RB Darrell Henderson With Six MVP Awards; LSU Strong Safety Greg Delpit With Six MVP Awards; LSU Inside Linebacker Devin White With Six MVP Awards; Washington LB Ben Burr-Kiren With Six MVP Awards; Clemson DE Clelin Ferrell With Six MVP Awards; and Florida Defensive Tackle Jachai Polite With Six MVP Awards. Players With Five MVP Weekly Awards Include Boise State Quarterback Brett Rypien; Notre Dame Running Back Dexter Williams; Utah Linebacker Chase Hansen; Texas Inside Linebacker Greg Johnson; Texas A&M Tight End Jace Sternberger; Alabama Tight End Irv Smith; Mississippi State Defensive Tackle Jeffery Simmons; Mississippi State Defensive End Montez Sweat; Wisconsin Running Back Jonathan Taylor; California Inside Linebacker Evan Weaver; Wisconsin Inside Linebacker T.J. Edwards; and Washington Strong Safety Taylor Rapp. Running Backs and Tight Ends With Four MVP Weekly Awards Included Iowa State All-Purpose Running Back David Montgomery; UCLA Tight End Caleb Wilson; Washington All-Purpose Back Myles Gaskin; Georgia All-Purpose Running Back D’Andre Swift; UCLA All-Purpose Running Back Joshua Kelley; Kansas State All-Purpose Running Back Alex Barnes; and Utah Running Back Zack Moss. Wide Receivers With Four MVP Weekly Awards Included Ohio State Wide Receiver Parris Campbell; Ole Miss Wide Receiver A.J. Brown; Stanford Wide Receiver J.J. Arcega-Whiteside; Oregon State Wide Receiver Isaiah Hodgins; Oklahoma Slot Wide Receiver Marquise Brown; Oklahoma All-Purpose Wide Receiver Ceedee Lamb; Arizona State All-Purpose Wide Receiver N’Keal Harry; and Purdue All-Purpose Wide Receiver Rondale Moore. Defensive Linemen With Four MVP Weekly Awards Included Houston Defensive Tackle Ed Oliver; Penn State Strongside Defensive End Yetur Gross-Matos; Alabama Defensive Tackle Isaiah Buggs; Texas Defensive Tackle Charles Omenihu; Ohio State Defensive Tackle Dre’Mont Jones;Ohio State Defensive End Chase Young; Clemson Defensive Tackle Christian Wilkins; Michigan Edge Rush End Chase Winovich; Michigan State Edge Rush End Kenny Willekes; and Boise State Edge Rush End Curtis Weaver. Tight Ends and Offensive Linemen were Very Difficult to Evaluate and Give a Weekly MVP Award for each Week, but there were Four Tight Ends that Were Very Impressive and they were Awarded Several Weekly MVP Awards. 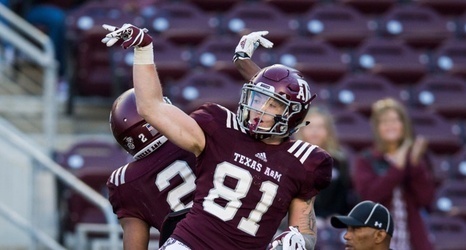 All Four of These Tight Ends are Super Freaks and they Include Texas A&M Tight End Jace Sternberger; Alabama Tight End Irv Smith; Missouri TE Albert Okwuegbunam; and Iowa Tight End Noah Fant. 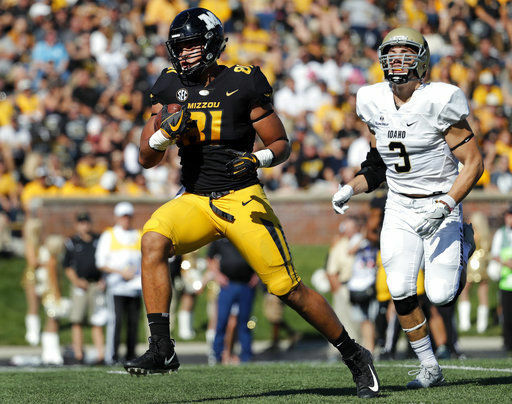 All Four Super Tight Ends Are Potential NFL #1 Draft Choices.